Cardflick, a new app which launched in the iTunes store today, hopes to revolutionize how people stay connected with their mobile phones. The beautiful app lets people “flick” their contact details between phones, with all the information stored in the cloud. What’s more, once you’ve accepted someone’s contact request, you can call or email them directly from the app, without having to search your phonebook. What makes CardFlick unique is that digital cards are not only useful for storing and transmitting people’s information, they’re downright gorgeous. The team has worked with some of the top digital designers to make sure that each person’s visiting card is a piece of art. We built CardFlick because we wanted to put the people back in contact sharing. Too many other services focus only on the data, losing the personal brand and experience that comes with handing someone a business card. 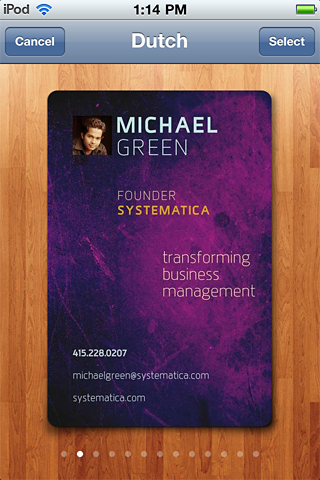 We want to turn that around, and bring everything awesome about business cards to the ease and power of digital sharing. CardFlick is similar to Bump, where users exchange information by tapping their phones together. With CardFlick, you literally flick your card, like Gambit from the X-Men, and the information is passed on virtually. In a crowded room it could turn into a fun game. And because all information is stored in the cloud, should you change your email address or phone number, CardFlick will automatically update your data. One of the great features of CardFlick is the pre-designed templates, such as Bateman, which harkens back to Christian Bale’s character in the movie American Psycho. Swagga is another stunning example, as is Metropolis. If either are not your flavor, there are more than a dozen to choose from currently. 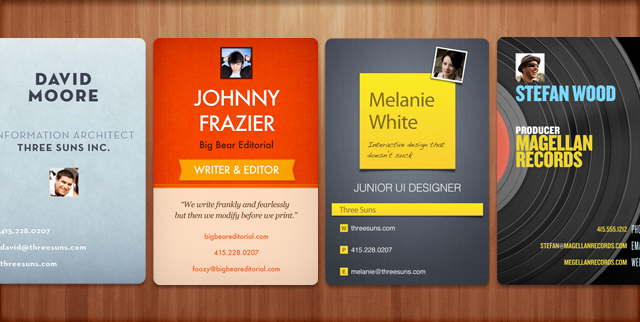 In the future, expect many more templates, all created by top designers. Cardflick comes from Kid Bombay, the makers of IceBreaker , an app that lets you connect with similar Twitter users based on interests, and proximity (hmm, a theme?). Kid Bombay also created the Yammer app for the Android platform. We’ve got three free promo codes for readers who’d like to try the app out for themselves. Leave a comment below as to why we should choose you, and we’ll select three lucky winners.